Melbourne's central suburbs are fairly well covered by train and tram services. All suburban trains terminate at Flinder St Station, but they pass through the underground city loop on their way in and out of the city. The best online guide for general information regarding the Melbourne public transport system is Metlink, which has maps and timetables for Melbourne's trains, trams and buses. The Melbourne venue for the IC are three ovals in Royal Park, not far from Carlton's home ground, MC Labour (aka Princes) Park. To get there from downtown Melbourne without a car, you have two main options. The quickest is to take an Upfield line train from any of the stations in the city loop. 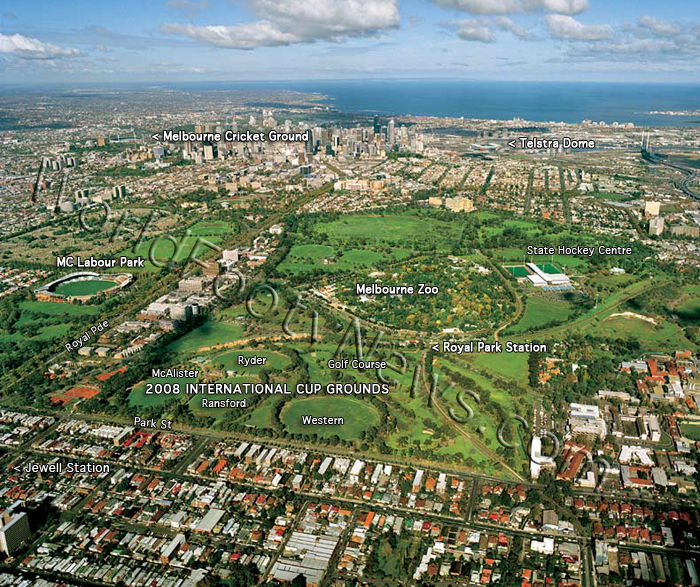 The grounds are roughly halfway between the stations of Royal Park (Melbourne Zoo) and Jewell. Jewell is a few minutes past Royal Park on the train, but it's a slightly shorter walk to the grounds. There is a walking/bike path alongside of the tracks that connects Royal Park and Jewell stations. This link takes you to a map showing the path (which isn't labelled on Google Maps), as well as both stations and the grounds. Take the no. 19 tram (direction North Coburg) from Elizabeth St in the city. This tram goes up Royal Parade, passing MC Labour Park. You need to get off the tram at the Brunswick Rd stop and turn left into Park St - it's the street BEFORE the Irish theme pub Bridie O'Reilly's, the last one on the left you passed before the tram stopped. The grounds are on the left hand side (as you travelled out on the tram). The following aerial photo (looking south) shows where all these locations are in relation to one another. It's only hosting one IC match, but it probably isn't every day you're in Australia, so drop into Geelong and see the action between the Lions and the Vikings. It's being played at St Mary's Football Club, whose home ground is right next door to Skilled Stadium in Kardinia Park home of the AFL's reigning premiers Geelong. Trains serving country Victorian destinations (including Geelong and Warrnambool) are operated by V/Line. All trains going interstate or to country Victoria depart from Southern Cross Station, previously known as Spencer St Station. You need a Geelong line train - get off the train at South Geelong and Kardinia Park is the big stadium you saw on the right hand side of the train as you arrived. It's around 300m walk. Once you're at Kardinia, walk past the main stadium and you'll see "West Kardinia Oval". The train trip from Melbourne to Geelong takes just over an hour. Most Warrnambool services also stop at South Geelong, but check before you get on. Trains serving country Victorian destinations (inlcuding Geelong and Warrnambool) are operated by V/Line. The train to Warrnambool also leaves from Southern Cross in Melbourne, passing through Geelong on the journey. It takes around 3 hours to make the trip and costs A$35.30 for a full-fare ticket. Warrnambool's railway station is located at the "bottom" (south) of the centre of town, towards the waterfront. Walter, Reid and Mack Ovals are all located together in Albert Park. To get there from the railway station, walk north up Fairy St until you reach the Princes Highway (aka Raglan St). Turn right, then walk three blocks and turn left at the Hopkins Highway. Walk up the hill, and at the first intersection take Cramer St, which will branch to your right at an angle. About 100 meters past this intersection you'll see Albert Park on the right hand side of the street (about a 2 km walk altogether). Google Maps provide an excellent view of Melbourne, and good street labels for Warrnambool (not so good satellite images).